In February 1992, Jim Foster, Founder of the Arena Football League, met with a small group of local investors with the idea of bringing an expansion franchise to Des Moines, Iowa. 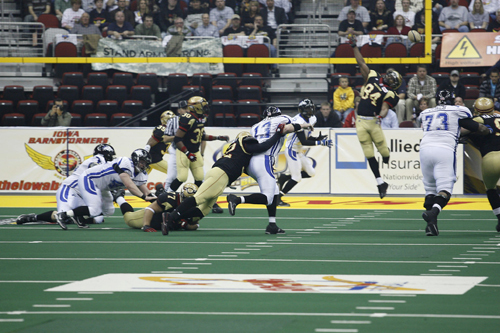 One year later the Arena Football League played its first game in Iowa; a preseason match-up between the Arizona Rattlers and Cleveland Thunderbolts. The teams played in front of a sell-out crowd of 10,082. Following the success of that game, the AFL brought their All-Star Game to Des Moines that August and in April of 1994, Des Moines was awarded an expansion franchise for the 1995 season! On February 6, 1995 the Iowa Barnstormers introduced John Gregory as their first ever head coach. The Barnstormers kicked off their inaugural season on the road May 12th against the Milwaukee Mustangs and returned home a week later on May 20th to take on the Miami Hooters. By the end of June the Barnstormers had sold out four straight games. Their good fortune continued through the summer as the team qualified for playoffs, scoring their first playoff win in August of 1995. 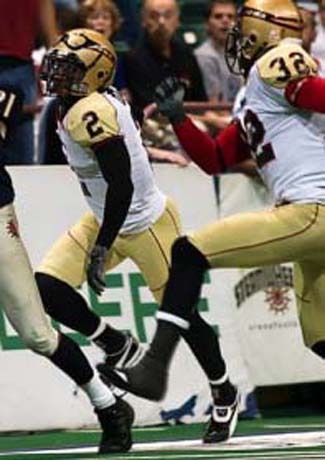 It only took until their second season for the Barnstormers to make it to their first league championship game as they qualified for ArenaBowl X in 1996. Unfortunately, the Barnstormers were unable to pull out a victory. However, a sold-out crowd in Veterans Memorial Auditorium along with a record TV audience tuned in to ESPN to see the boys play in “The Barn.” They made a repeat appearance to the ArenaBowl in 1997, but once again fell short of a victory. In 1998 the Barnstormers saw one of their stars, and former Iowa native Kurt Warner, shine even brighter when the quarterback signed a contract to play for the NFL’s St. Louis Rams. Warner would later lead the Rams to a SuperBowl XXXIV victory in January, 2000. Warner led the Rams back to the SuperBowl once again in 2002 and later brought the Arizona Cardinals to their first SuperBowl game in franchise history in 2010. With Warner gone, the Barnstormers found their next great quarterback as newcomer Aaron Garcia grabbed the starting role after Warner’s exit. 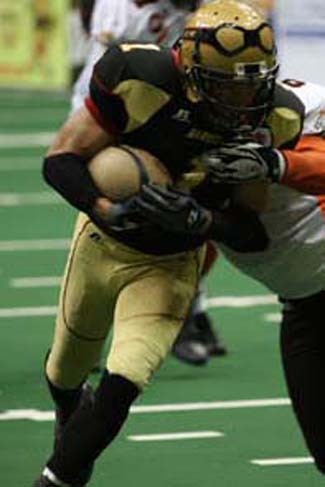 Garcia went on to break many of Warner’s team records, spending four years with the Iowa franchise. 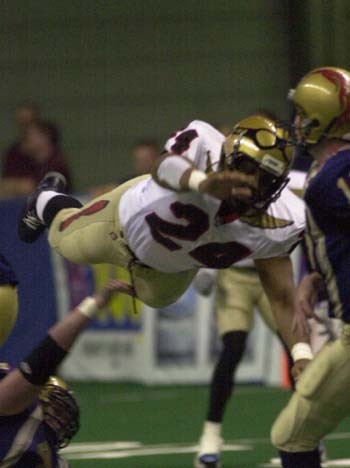 Under the leadership of Garcia, the Barnstormers returned to the playoffs in 1999 (improving from 5-9 in 1998 to 11-3 in 1999). 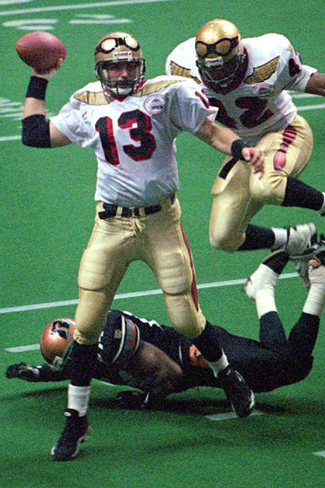 The 2000 season sent them to the playoffs once again and was highlighted by the return of Kurt Warner to Iowa to see his #13 jersey become a retired number in the Barnstormers organization. Following the 2000 season, the Barnstormers franchise was sold to the NHL’s New York Islanders ownership group, led by Charles Wang and Sanjay Kumar. They believed that the team needed a more modern venue and they were searching to place the team in a larger market. That fall, the AFL approved to move the team from Des Moines to Long Island, New York and renamed the team, the New York Dragons. However, this did not remove the team completely, because the Barnstormers were awarded an af2 franchise carrying the same name. The franchise played one season in af2 before ceasing operations in 2001. Vet's Auditorium was left dark and the Barnstormers were gone. Over the next few years, the sports landscape in Des Moines changed drastically, most notably with the opening of Wells Fargo Arena in 2005. With a new facility in place a group of local investors led by Jeff Lamberti applied for an af2 expansion franchise in 2007 and the Barnstormers were re-born! The team returned for the 2008 season and the fan support came back as though the team had never left. The Barnstormers may have ended their return season with a record of 6-10, but were second in the league in attendance averaging over 9,000 fans per game. 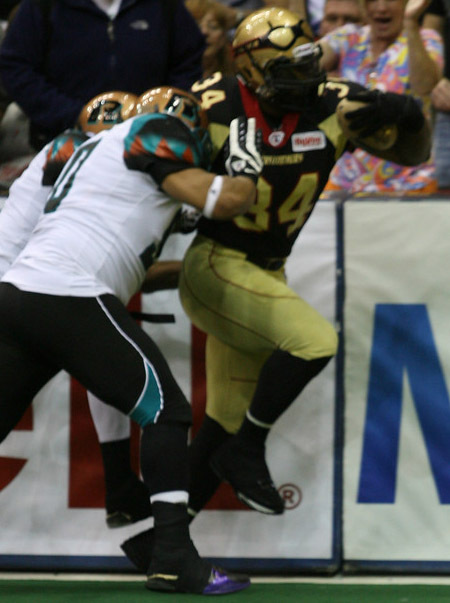 The 2009 season proved that the Barnstormers could only continue to grow, they improved their record to 13-5 they made it to the second round of playoffs and pushed their attendance up to over 9,500 per game. In 2010, the Barnstormers took their next step forward as they once again became part of the Arena Football League. 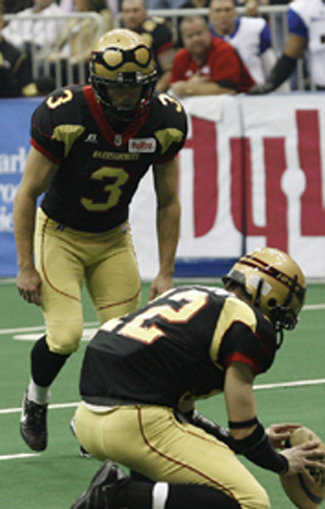 The 2010 and 2011 seasons provided the Barnstormers with some growing pains, as the franchise finished with 7-9 and 5-13 records. Following the 2011 season, the Barnstormers reached out to Mike Hohensee to become their next Head Coach. Hohensee brings with him a proven track record, including an ArenaBowl victory as Head Coach of the Chicago Rush in 2006. In 2012 Hohensee was named to the Arena Football Hall of Fame. The team has developed a group of young exciting players and is ready to make the next step in 2014. We need you, the fans, to come along for the ride! -The Barnstormers played their first regular season game in the AFL on May 12, 1995 on the road against the Milwaukee Mustangs. The Barnstormers won the game 69-61 after both teams scored a combined 24 points in the final 40 seconds of the game. 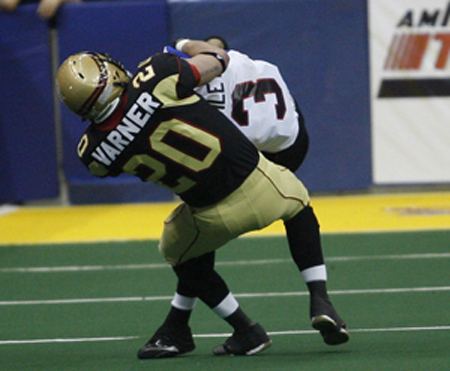 -The Barnstormers made it to the playoffs in their first year as an AFL team. The game was held on August 13, 1995 on the road in Arizona. The Barnstormers won that game 56-52. - August 26, 1996 saw the Barnstormers first ArenaBowl appearance held in “the Barn,” against Tampa Bay; unfortunately, the Barnstormers lost 38-42. - The Barnstormers played they first game in Wells Fargo Arena on April 14, 2008 against the Lexington Horsemen, but were unable to pull out a victory and lost 64-61. 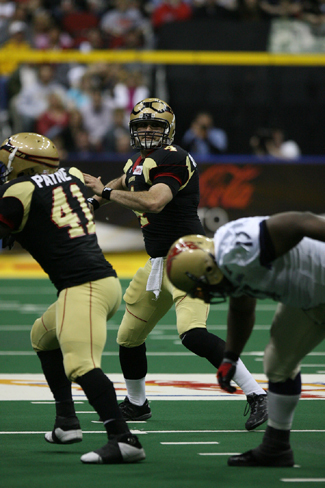 -July 31, 2009 was the first playoff appearance for the Barnstormers in the af2 League. They defeated the Manchester Wolves 74-50, but were defeated by the Green Bay Blizzard in the second round of playoffs. 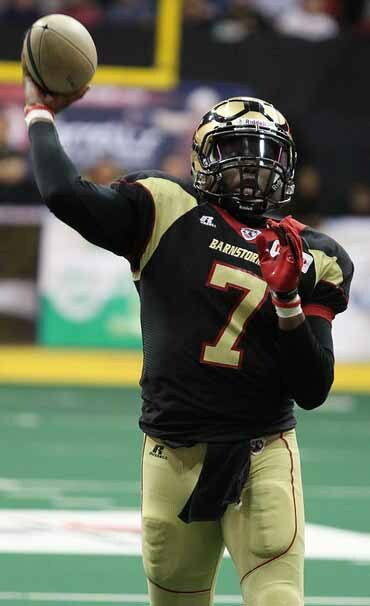 -April 2, 2010 was the first game for the Barnstormers in their return to the top level of arena football and was also their largest crowd with 12,184 fans in attendance. 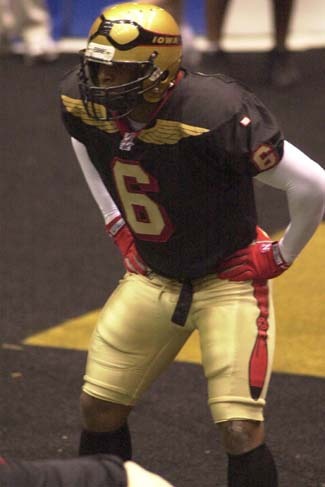 The Barnstormers have had distinctive uniforms true to the aviation theme. The original uniforms included wings on the jerseys across the shoulders and a propeller on the sides of the pants. Since the Barnstormers return the uniforms have been modernized and those iconic pieces removed. One component of the uniform that the team held on to was the very unique helmets. The gold helmets with the aviator goggles have not changed since the original team and continue to be one of the most recognized helmets. In 2008 The Shutdown Corner ranked the helmet 8th as one of the coolest helmets of all time. The NFL Pittsburgh Steelers, Green Bay Packers, and Indianapolis Colts were also on the list in the Top 10. 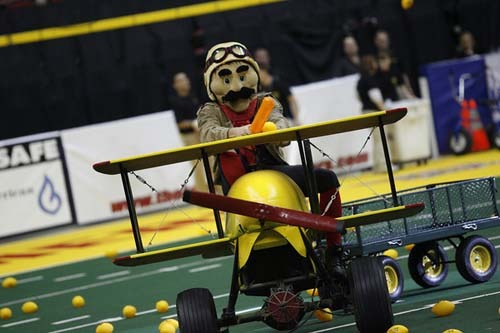 Prior to the 2013 season, the Barnstormers made some nobable changes to their uniforms. The team replaced the gold pants with black ones that contained a red stripe on the side. In addition, the colors on the helmet were reversed, making them black with gold goggles. The changes were well liked by fans of all ages. Besides having the best fans in arena football to cheer on and support the team, the Barnstormers have a great support crew. Billy the Barnstormer has been a key component of the team since the beginning. He is seen at each game supporting the rowdy crowd and flying Barnforce One across the field. Billy’s loyal companion Ace has recently become the teams second mascot and the friendly dog is a favorite among the kids. It wouldn’t be a football game without pretty girls down on the sidelines cheering on the team. The Barnstormers started out by having two cheering squads, one group, Flightline, focused on cheering for the team and leading the crowd on the sidelines, the Skyline danced and performed on the field during breaks from the game. Today there is only on group of girls down on the sidelines, the Storm Chasers. The Storm Chasers perform at the beginning of the game and during halftimes on the field and can be seen dancing on the sidelines as well during the game. In addition, they participate in community activities year-round throughout the great state of Iowa.